Nutrition in the ICU: Understanding the Caloric Balance - Medtrition, Inc. Patients in the ICU on mechanical ventilation are at increased health risk if they are continuously overfed. Overfeeding can lead to and hypercapnia making it more difficult to be weaned off the ventilator. Overfeeding can also lead to complications as well as exacerbation of current conditions. Patients who are malnourished may experience issues with refeeding syndrome if fed too quickly, too soon. Refeeding syndrome, which can cause diarrhea and an imbalance of electrolytes (potassium, magnesium and phosphorus) can sometimes be life threatening. In contrast, patients who are already obese and in need of significantly larger amounts of protein are often challenged with meeting protein needs without providing excessive amounts of calories, further enhancing their comorbidity and likely leading to other complications. Propofol is a lipid (fat)based sedative that provides 1.1 kcal per mL and is often provided by continuous drip (non stop). A patient who is on a 20mL/ hr drip could be getting over 500 extra non nutritive calories, reducing the amount of calories that can be provided by enteral formula. The challenge of not overfeeding becomes an even bigger barrier when reviewing modular proteins as the majority contain 100 calories per 30mL dose making overfeeding almost impossible to avoid. ProSource TF is an ideal product in this setting because, unlike its competition it provides only 40 calories per serving while still delivering a significant protein impact. Because the product does not contain additional carbohydrates, it will also not impact glucose levels, unlike other liquid protein products. PSTF was designed specifically for the enterally fed patient and the ICU is the ideal setting for utilization. 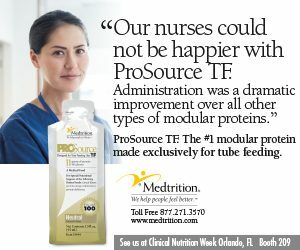 Ease of administration, high protein content and a lower calorie load make it the only choice for protein provision in the ICU. This entry was posted in Blog on July 16, 2018 by Karen Sudders.